If you're getting bored stiff with seeing and hearing guitars and drums all the time, fear not- there's a group of eager musicians/performers/composers who are just as sick to death of them and are really making music their own way. From anything that you can find in your house to odd creations that they've build from scratch, there's a lot more to be explored with what we know as instruments. So at the beginning of the year, Experimental Musical Instruments put together a showcase of these amazing performers and their inventions. EMI had already put out the extraordinary Gravichords box set along with a second volume coming out this Spring. We start with a play-by-play call of the Knitting Factory show along with composer/musician David Beardsley, editor of the internationally acclaimed e-zine Juxtapostion. Jason: I'd never seen someone actually play a theremin though I've heard it's eerie sounds on a number of records (remember "Good Vibrations"?). It's not really 'played' the same way that other instruments are played- you never actually touch it but you wave you hands (or any other object) around its field to produce sounds. Simons' performance came across as part sci-fi and part mime as a result as he waved his hands, almost looking like he was conducting and using space to create sounds. Later, another thermin player (using an older, modified one) joined him along with a singer. Quite a performance. Jason: Jon and Mark were performing instruments of Reed Ghazala, creating huge waves of noise. 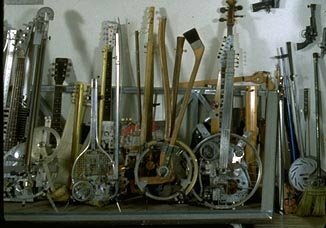 Reed's raw materials are short-circuited instruments and toys that have been used by Peter Gabriel, Tom Waits and King Crimson among others. David: Reed Ghazala sent a fellow who explained circuit bending techiques and then they improvised with a pre-recorded tape. Circuit bending is when you randomly connect wires inside of cheap electronic toys or synthesizers to make them freak-out. He then connects switches to the discovery and refinishes the instrument. Sounds sort of like an air raid. Jason: Fricke wheeled out his beepmobile- a combination of a bicycle and multi-horn instrument, playing it with an audience member (who did 'Taps'). The multiple mouth pieces let both of them play together- they were enough for an ensemble to play it all at once. Actually Fricke's idea is to have a whole ensemble of similar instruments play together (the performance space wasn't large enough to accomodate this unfortunately). Just for good measure, the instrument is also able to shoot out smoke. David: Luthier William Eaton performed on his Lyre and a few harp guitars. The guitars sounded great but I think he went overboard showing off how one of his guitars had a synth pickup - sounded like Roland to me. Jason: Eaton demonstrated how a lyre (stringed instrument) is played against the skull so that it produces sound and vibrations from there. The synth pick-up had him imitating horns, piano, drums and other instruments. As David said, it was a little showy but I thought it was still fun. Eaton has built instruments since '71 with the help of a friend who provided him with wood from Central America. David: Skip LaPlante and his Music for Homemade Instruments (MHI) ensemble played two gamelan influenced pieces. Skip is also a regular at American Festival of Microtonal Music concerts. David: Susan had done a bit of research on ancient instruments (pre-Columbian and North American Indian). She played these flutes with one mouthpiece and multiple flutes. One of these she called the combination tone flute because, well..it created combination tones that beat like crazy in my inner ear. Let's hear it for microtonality! Jason: She made howler monkey sounds that had nothing to do with 'music' per se- it was very primitive, full of screaming and moaning. Very impressive. David: Ken Butler finished up the evening with his home made hybrid instruments. Electric golf club, two hockey stick guitars that he also bowed, electric umbrella, electric toothbrush, his head, his pants zipper, electric snow shovel. He'd capture a loop in an echo and play over that. Weird Southeast Asian microtonal melodies. Really wild. Jason: He set up a synth pick up to repeat certain patterns which he played over with these instruments that you would think were instruments. Some of these amazing inventions can be seen in the front bar of the Knitting Factory- they look intriguing but you'd never figure that someone could actually play them, switching between them pretty rapidly. Ken did just that and he brought the house down. What a performer! Also see our other article from Experimental Musical Instruments on making shell trumpets and visit the EMI site.